questionnaire designed to incorporate the 71 attributes was administered to fans at Whitecaps games. The questionnaire was administered to 1,010 respondents. From this, the marketing research company was able to determine the information they were looking for. The basics were determined to be values such as stadium safety, restroom cleanliness, and variety in the fcod items available. The Whitecaps not only want to meet these basic expectations, but also to surpass them to guarantee that fans will return and be loyal. The value issues are the ones that can really help the team build loyalty. These included things like helpful box office personnel. convenience of purchasing tickets, convenience of parking, and providing the opportunity for autographs. Irritations were determined to involve souvenir price, quality, and lack of variety. However, the research also showed that fans don’t really expect to be pleased with this area of sports attendance.It was also determined that there were no unimportant aspects in this survey. 1. In order to determine the.relative importance of value drivers, what type of data analysis should Message Factors conduct? 1. In order to enbance the value of Whitecaps games to the fans, what should Scott Larie do? 1. 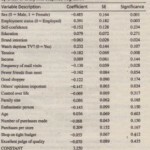 The regression model is estimated using the entire data set. 2. The available data are split into two parts, the estimation sample and the validation sample. The estimation sample generally contains 50 to 90 percent of the total sample. 3. The regression model is estimated using the data from the estimation sample only. This model is compared to the model estimated on the entire sample to determine the agreement in terms of the signs and magnitudes of the partial regression coefficients. 4. The estimated model is applied to the data in the validation sample to predict the values of the dependent variable, Y, for the observations in the validation sample. S. The observed values, Yj,and the predicted values, Yj, in the validation sample are correlated to determine the simple r-. This measure.r-, is compared to R2 for the total sample and to R2 for the estimation sam ole to assess the degree of shrinkage. Thus the coefficient bl is the difference in predicted Yj for nonusers. as compared to heavy users. The coefficients b2 and b3 have similar interpretations. Although “heavy users” was selected as a reference category. any of the other three categories could have been selected for this purpose.